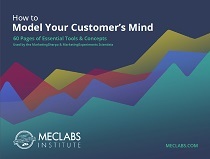 Last week we discussed results of the MarketingSherpa Consumer Purchase Preference Survey, showing the ways customers want to receive regular updates and promotions. This week we zoom in on demographic differences in consumers’ preferences. 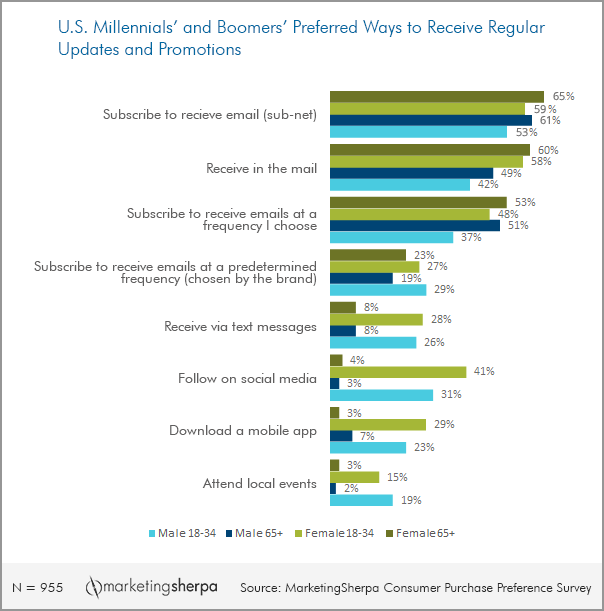 Read on to discover how male and female millennials and baby boomers prefer to receive updates and promotions. As you may already know if you follow Chart of the Week, we have conducted two surveys — a marketer survey and a consumer survey — looking to compare what consumers say they want and what marketers actually do to help us build content for MarketingSherpa Summit 2016. In the previous Chart of the Week we discussed survey data about how people in general prefer to receive updates and promotions from companies that they want to do business with. This week, we take a deeper look at those results to learn how preferences to receive updates and promotions differ by age, gender, region, income and presence of children in the household. We asked consumers, "In which of the following ways, if any, would you prefer to receive regular updates and promotions from companies that you are interested in doing business with? Please select all that apply," and looked at demographic differences in their preferences. We looked at millennials — defined as 18- to 34-year-olds — and baby boomers — defined as 65 years and older — by gender. In addition, we explored preferences by region, income and presence of children in the household. On the email front, baby boomers (52%) preferred to receive emails at a frequency they chose more than millennials (42%). However, millennials (28%) preferred to receive email at a predetermined frequency chosen by brand more than baby boomers (21%). Not surprisingly, millennials (36%) were much more interested in receiving updates through social media than boomers (4%). In regard to mobile methods of communication, also not surprisingly millennials (27%) were more interested in receiving text messages from brands than baby boomers (8%). Millennials (26%) were also more interested in downloading mobile apps than boomers (5%). Millennials (17%) were more interested in attending local events than baby boomers (3%). Overall, women (52%) favored receiving email at a frequency they chose more than men (46%). Women also favored receiving updates and promotions in the mail (57%) more than men (49%). Northeasterners (54%), Southerners (58%) and Midwesterners (53%) had a stronger preference for print updates in the mail than Westerners (46%). Westerners (42%) favored visiting a company’s website when they wanted updates more than Midwesterners (34%). The Midwest had a larger proportion of people (12%) who preferred not to receive any updates and promotions from brands compared to the Northeast (7%) and South (6%). People with incomes less than 50k (27%) were more inclined towards receiving emails at a predetermined frequency than people with incomes 100k and above (20%). People with incomes less than 50k (27%) were also more interested in getting updates from social media (24%) than people with incomes 100k and above (14%). People with children in their households (57%) were more interested in receiving updates and promotions in the mail than people without children (52%). People with children in their households (33%) were also more interested in getting updates on social media than people without children (14%). People with children in their households (28%) were more inclined towards getting updates via text messages than people without children (12%). A bigger proportion of the people with children were also more inclined (26%) towards getting updates by downloading an app compared to people without children (10%). To sum up, millennials are more interested in receiving emails at predetermined frequency chosen by brand than baby boomers, while boomers are more interested in receiving emails at a frequency they choose. millennials are also more interested in social media, local events and mobile-based methods like text and apps compared to boomers. Women are more interested in receiving print updates in the mail and receiving email at a frequency they choose compared to men. Westerners have less interest in receiving print updates in the mail compared to inhabitants of other regions. People with lower incomes have more interest in receiving email at predetermined frequency and more interest in following brands on social media for updates compared to people with higher incomes. People with children in the household are more interested in receiving print promotions in the mail, follow brands on social media and using mobile methods like texts and apps compared to people without children in their households. Join us on March 9 for the post-Summit wrap-up webinar where the MarketingSherpa Editorial Team will discuss the most inspirational and actionable lessons from this year's two-day event in only one hour.